Keeping e-mail cheap requires an e-mail infrastructure that can handle the growing volume of mail. Since the need for managed storage, in terms of high-performance storage space, increases by up to 30% per year by email, mail server architectures quickly reach their limits and continuously entail investment costs. In addition to hardware and licenses, the costs for IT administration and the IT helpdesk also increase - linearly with the volume of e-mails. The e-mails are stored together with attachments in a proven audit-proof archiving system designed for long-term archiving. In the mailboxes are then only links of small data size. During archiving, the integrated single instancing procedure automatically eliminates duplicates. The result: drastically reduced memory requirements. The volume on the mail servers drops on average by 80%. Thanks to the innovative Three Phase Archiving, the number of mailbox items is also significantly reduced. A more stable e-mail infrastructure is the result, which is also equipped for a long-term rapid growth of the flood of e-mails. 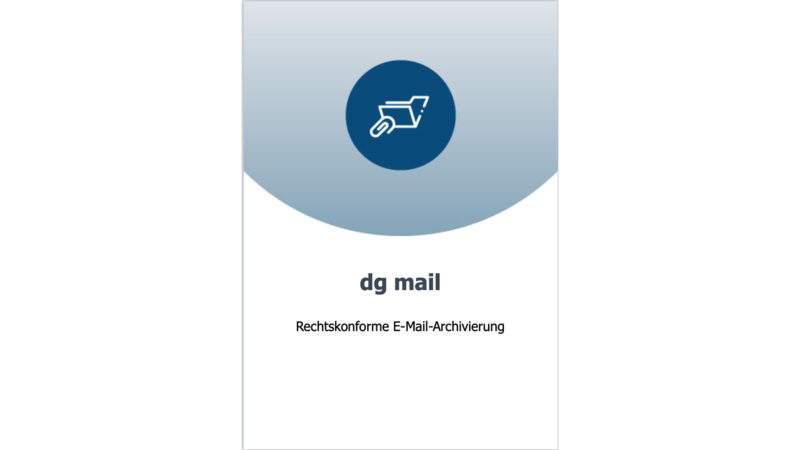 dg mail is integrated into the existing e-mail infrastructure on the server side. The program archives all e-mails and attachments. In doing so, you determine the procedure.